Almond Joy Donuts. We all need a little donut in our life sometimes. That’s exactly why I made you these Almond Joy vegan Donuts! They will not disappoint! I have several other healthy donut recipes on the blog. My favorite is the Pumpkin Chai Donuts, but a close second would be my Banana Chocolate Chip Donuts. This recipe would be great to make-ahead and then freeze. That way, you can have quick breakfasts on the go. These healthy donuts are vegan and gluten free too. Also a super cinch to make! If you love all things almond joy check out this post too. A healthy donut that tastes like an almond joy! In another bowl , mix the wet. Let cool before making the chocolate coating. To make the chocolate coating, use a double boiler method to melt the chocolate chips and coconut oil. 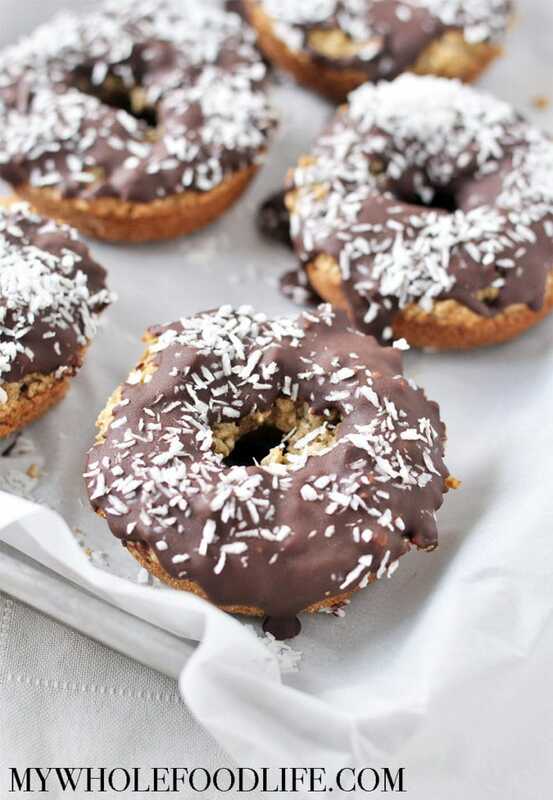 Once melted, dip the top of each donut into the chocolate and sprinkle with shredded coconut. Place the chocolate coated donuts onto a baking sheet. Place the baking sheet in the fridge when all are done. Keep these stored in the fridge or freezer. They should last at least a couple weeks in the fridge, and several months in the freezer. Enjoy!